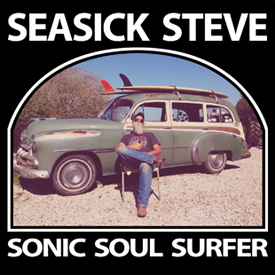 I can’t say I’ve been a huge fan of Seasick Steve over the last few years; but Sonic Soul Surfer is definitely changing my attitude towards the septuagenarian Californian. When I first saw Seasick Steve play in front of 30 or so people in 2004 I wasn’t sure if he was a novelty act; and his “Aw shucks” attitude on his many TV appearances did little to change my mind….until now. Although I have two of his earlier albums; they’ve lain un-played for years, but I’m pretty sure that this album will sit in the car all Summer. First track, Roy’s Gang opens with some pretty weird guitar licks, and when the rhythm section kicks in with a real funky groove Steve goes psychedelic; grunting and groaning his way through a very danceable song about life on the road. No ‘one trick pony’, the way TV would have you believe Steve runs the gamut of all things Bluesy here, with songs like In Peaceful Dreams featuring Georgina Leach on fiddle as the singer performs an enchanting lament; then later on Sonic Soul Boogie; it really is what it says on the tin and reminiscent of early ZZ Top; and I don’t think that’s by accident. The album is excellent from start to finish; but two tracks will make it onto my Sounds For The Summer mixtape – the driving beat of Summertime Boy; with it’s dirty guitar licks from Luther Dickinson and some amazing Jaw Harp from Ben Miller and Barracuda ’68 that is pure signature Seasick Steve but mixed up with Muddy Waters and Ry Cooder – hunt it down like a rabid dog. A lot of thought has gone into the balance of the album; as it rolls along very nicely and comes to a close with three fulsome and truly elegant Blues songs We Be Moving opens with some pretty special guitar picking then Steve’s voice sounds like it’s been soaked in honey and tobacco leaves as he sings about never being able to settle down in one place; and that won’t change until he’s “cold in the ground.” This is instantly followed by the token love song; Your Name and it’s well worth waiting for as it’s slow drawling Country-Blues and a bit of a doozy! Then the Album draws to a close with Steve all alone singing Heart Full of Scars and….and….and; well it just may be Seasick Steve’s finest song and deserves to be heard by an audience far larger than the one that sees him as a ‘character that plays weird homemade guitars’ and if there’s any justice it will pick up Award after Award at the Grammys and the like! Unlike my memories of his earlier albums; Sonic Soul Surfer comes across very much as a band album; with the drums and bass being every bit as important as Steve’s makeshift guitars; and I can’t let Seasick Steve’s raw and greasy production go unmentioned as he’s brought the very best out in himself.